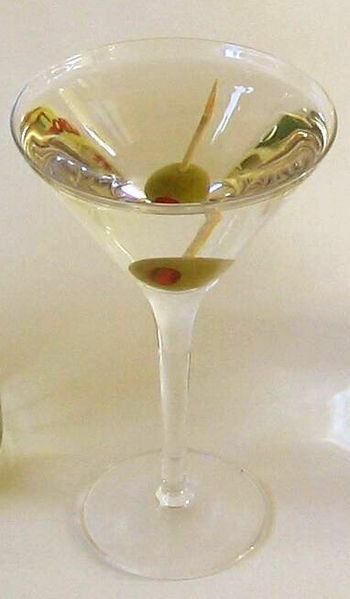 The martini is a cocktail made with gin and vermouth and garnished with an olive. Over the years, the martini has become one of the most well-known mixed alcoholic beverages. While variations are many, a standard modern martini is an approximate four to one ratio, made by combining approximately two ounces (or 55ml) of gin, and approximately half an ounce (or 15ml) of dry vermouth. Left: The Martini, more so than any other drink, embodies the class and style of the cocktail in the popular imagination. Some prefer somewhat less vermouth—about a five or six to one proportion of gin to vermouth. Many bartending schools insist that a cocktail shaker tends to dull the taste of the vermouth. However, shaker mixing is common due to influences of popular culture, notably the fictional spy James Bond, who always asked for his vodka martinis "shaken, not stirred". The ingredients are mixed then strained and served "straight up" (without ice) in a chilled cocktail glass, and garnished with either a green olive or a twist of lemon (a strip of the peel, usually squeezed or twisted to express volatile oils onto the surface of the drink). Pour all ingredients into mixing glass with ice cubes. Stir well. Strain in chilled martini cocktail glass. Squeeze oil from lemon peel onto the drink, or garnish with olive. Adjust the gin/vermouth ratio for a drier martini. The trend in the latter part of the 20th century was to go "ultra-dry" by limiting the amount of vermouth to smaller and smaller quantities. However, this limits the drink to being essentially a cocktail glass of cold gin. The additional herbal and tempering qualities of vermouth are necessary for the proper flavor profile. A 6:1 gin to vermouth ratio is considered "ideal" though your taste may vary. Replacing the green olive with a pickled cocktail onion turns the Martini into a Gibson Cocktail. More extreme variants introduce triple sec and/or bitters, but the "classic" recipe stands as merely gin and vermouth. The Martinez is considered to be "the great grandfather of the Martini cocktail". Ingredients: dash of bitters; 2 dashes maraschino liqueur; 1 pony (shot glass) Old Tom gin; 1 wine glass vermouth; 1/4 slice lemon. Mix all ingredients, except lemon, in a shaker with cracked ice, stir (not shake), then strain into a chilled cocktail glass. Note: Original recipe advised adding two dashes of "gomme (sugar) syrup, if the guest prefers it very sweet." If you want to be James Bond, the classic Fleming recipe involves an ounce and a half of vodka, an identical portion of gin, and a half-ounce of Lillet Blanc, shaken over ice and served with a twist of lemon. Stuffed olives go well with a martini. The "Spanish" olive, green stuffed with pimento, is the default. However, those olives stuffed with a garlic clove or bleu cheese are popular as well. Adding a splash of the olive brine to the drink makes it a "Dirty Martini." Some prefer the additional element of saltiness that this adds. A Churchill martini involves shaking 6 parts of gin, straining into a cocktail glass, looking at the bottle of vermouth, and serving with an olive garnish.